I made a test teapot block this morning! I used Pink Penguin’s awesome pattern and tutorial, with the pattern enlarged to 150%. It came out to round about 7.75″ x 9.5″ and took me three hours, which included cutting out all the pattern pieces (both the paper and freezer paper ones). Hoooopefully, I’ll be able to ask my quilting bee-mates to make these for my month… I think a whole quilt of these would be fun! Edit: Here’s a picture of the freezer paper I have. I got it in the cling wrap / ziploc bags aisle in my local grocery store. Hmm, now I think that would be do-able (or at least I’d give it a stab) but we can’t get freezer paper in the UK, so I think you’d have to include that. 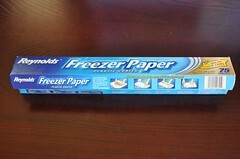 Incidentally, what exactly IS freezer paper? I’ve gathered that you don’t stick it in the freezer, but that’s about it! Yup, I was planning to include freezer paper in my packages. 🙂 It’s kind of like wax paper, but only one side is waxy, and the other side is matte. The waxy side goes on the fabric and your iron goes on the matte side, and then the paper sticks temporarily to your fabric. It actually is supposed to be used for storing food — I got mine in the aisle of my grocery store with the aluminum foil, cling wrap, and ziploc bags. These are really cute. I can see an entire quilt made of them. I like the fabrics and the selvage stripe too. 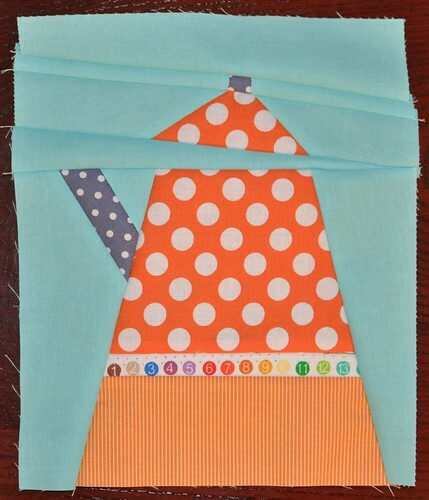 WIP Wednesday: August 3 July Bloggers’ Dinner Party win!